A recent report from Social Media Examiner cites that businesses and social media have finally announced their love affair, with 90% of marketers indicating that social media is important for their business. Should social media be integrated into a business’ marketing plan? I say yes. Consider the fact that a little over a decade ago; many businesses did not have a website. Businesses relied on direct mail, cold calls, and phone book listings to get their name out there. Today, with a little SEO and some compelling content, the interwebs will do the work for you. In fact, social media is an extension of word of mouth marketing. Instead of talking about how much you love a product or service to your friend over coffee, you’re able to review it online, post about it on Facebook, and tweet your love to the product’s customer service representatives. Messages are becoming shorter and smarter (140 characters is quite a challenge for some companies). Measuring quality online interactions is becoming easier to do with a plethora of free tools out there that indicate online influence. 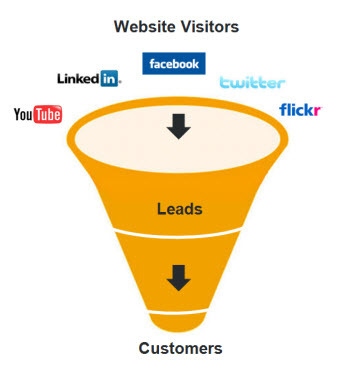 Overall, smart businesses use social media to gain more leads. Website visitors often come through social networks, which lead them directly to content that can convert them into a true sales prospect. It’s clear that businesses have embraced social media as a critical component to their selling needs. Whether you’re a consumer product, IT services, agency, or independent consultant – social media helps you get the word out. It’s brand awareness and word of mouth for those who like winning, duh! I believe that smart consumers in their 20’s, 30’s and 40’s have come to expect to see organizations promote their online presence. (Whether or not the online presence is useful or relevant, is another topic.) When visitors go to your company’s website, they expect to see links to your social networks, or even your blog. When sales leads receive your email or your direct mail piece, they also expect to see your social networks listed. It is another way to gain information as an informed consumer, and also to share information as a smart marketer. That’s just good business. So, what’s next for social media and business? Now that we’ve established the important relationship between social media and business, what do you think is next?